ALBA Berlin has been speaking German and English for almost four decades, but Spanish is taking over as a new important language. ALBA tried something different in recent seasons by merging the German work ethic with Spanish coaching success and it has paid off handsomely. The club has been to the German League, German Cup (twice) and EuroCup Finals in the last two seasons. The most visible face of ALBA's Spanish Army is head coach Aito Garcia Reneses, but he is not alone. His assistant, Israel Gonzalez, already worked with him at Gran Canaria. ALBA has an individual coach for players, Carlos Frade, who is also Spanish, just like the team's athletic trainer, Pepe Silva; its youth teams coordinator Raul Rodriguez; and its sports director, Himar Ojeda, who extended his contract until 2023 earlier this week. There are more Spanish coaches in youth teams, too. Ojeda was the first one to be recruited, and he brought everybody else. He had worked as sports director for Gran Canaria and Estudiantes and became an NBA scout. "I had a meeting with [ALBA general manager] Marco Baldi and he convinced me to come. I was happy working for the Atlanta Hawks, but he insisted on meeting me. I prepared the meeting to tell him I was not excited to be just a sports director, but to have a bigger project involving youth teams, too. Marco told me this was exactly what he was looking for. I thought I would break him, but it was the other way around," Ojeda said. "I was attracted by the challenge, too. I wanted to see if I was able to be a sports director in a foreign team." "We have a lot of kids with a lot of potential and by changing the way they practice, they will be able to read the game better and make better decisions." Once he started working, Ojeda started to bring aboard people he could trust. "I brought Raul first because his work with Gran Canaria's youth teams had been excellent and I knew him well after working with him. I identified we needed a person like him to lead our youth teams," he remembered. "Carlos Frade came next for player development. I tried to bring him in my first year, but he had an offer from Bilbao Basket. It took me a year to convince him! We also signed Pepe in my first year, but it was a bit of a coincidence. The whole technical staff had left with Sasa Obradovic and the club couldn't find good athletic trainers in Germany. Carlos told me about Pepe and he said he was very good. We brought him that summer to do post-season work, the players liked him and so did I, so we kept him," Ojeda said. In Silva's words: "Carlos Frade called me to work for two weeks, in some sort of training camp. They needed an athletic trainer, stayed for four weeks, they liked the way I worked and here I am, in my third season." Adding Frade was important; not a lot of teams have a coach completely devoted to player development. "I had been working for the club for some summers for individual workouts before I joined full-time. Raul arrived as a youth team coordinator and a year later, here I was," Frade said. "I always liked to develop players and do individual workouts. Himar had this idea since he was working in the NBA and convinced everyone to sign a player development coach. It is mandatory at the highest level, because players are thankful and assistant coaches do a lot of work, but cannot be everywhere. I am here to complement that work and coordinate the player development department for young players. We have a lot of kids with a lot of potential and by changing the way they practice, they will be able to read the game better and make better decisions. Young players have to put their skills into practice and make good decisions. We are trying to stress that and I am very happy with how it is turning out. Players are improving and can't stop practicing, before and after practices, even on days off, which is very satisfying." Frade had also worked for Gran Canaria, but before Aito arrived, from 2005 to 2009. Frade and Ojeda joined the team first and it was Ojeda who put together an offer to bring Garcia Reneses back to the sidelines. Ojeda's perseverance made it happen. "I called Aito when he retired and he wasn't even listening. It was impossible, but after that, I insisted. By January or February 2017. His agent told him and Aito was willing to do it. I thought we had some chances and waited for him, insisting. We managed to bring him to Berlin; we had a meeting and took him to a game," Ojeda revealed. "It took him some time to answer, but when all the competitions were over, he said yes. I didn't have to talk to him too much. At some point, he thought he could do it, but he needed some time. We waited and he joined the team... When we signed Aito, I knew we needed someone who knew his methods, someone who could explain to others how Aito works. He quickly asked for Israel and there was no need for me to tell him any other name." Coach Garcia Reneses found a new adventure in Berlin. He even opened an Instagram account, aitogarcia, in which he shares his experiences in Berlin by posting pictures of parks, building and birds. He also has a German assistant, Thomas Paeck, who has learned a little bit of Spanish. "It is a good thing for me, but I have to say that our German assistant coach is a perfect fit for our team. I had worked with Israel before, so it is much easier to communicate with him," Aito said. Asked about Spanish as the club's main language, Gonzalez joked about it. "We try to talk to our players in English and it is true that when we talk between us, we mainly do it in Spanish," Gonzalez said. "Our other assistant, Thomas, is German; I think it will be easier for him to learn Spanish than for us to learn German!" "From the very first day, I am shocked to see how much energy he has and how he puts in on the floor. He never misses practice, is willing to lead the team and sets the pace for all of us. It is a pleasure to work with him," Silva said about Aito. Garcia Reneses and Gonzalez had already worked together in Gran Canaria. Their mutual trust was key for Aito to bring him to Berlin. It was his only request before joining ALBA. "I met him in Gran Canaria. He completely understands and agrees with the way I see basketball. He helps me execute it working individually with players, just like Thomas Paeck," Aito said." Still, when you start working with someone, he may adjust to what you want or not, but Israel knew what I needed and that is always a safe choice." "I knew him already, but the fact that Aito thought about bringing me to Berlin with him makes me proud," Gonzalez added. "That meant he gives value to the work we did together in Gran Canaria and has given me the opportunity to have this experience." In what ways are all the Spanish coaches helping ALBA? It was a top-class organization, but the extra basketball knowledge in all aspects of the game has made the German powerhouse even better. "This club worked well before we all came; it is a club that has been able to adjust and reinvent itself. Everyone is very professional and the working group that landed here came with basketball knowledge and a first-level sports project. Spain is a basketball country and we put together a model organization with a group of talented people. It has fit perfectly and been very productive," Ojeda said. "Spain is a basketball country and we put together a model organization with a group of talented people. It has fit perfectly and been very productive." "We were welcomed from the very beginning and the ideas we brought in have been very well accepted. That allows us to feel good at work and that is key to get the results we've had until now. It is all due to the good connection with the people who were already here and the ideas we brought in," Gonzalez added. "So far, we are happy. We found here a group of players and coaches really willing to work hard and what we brought in is a different way to understand basketball and how to work. 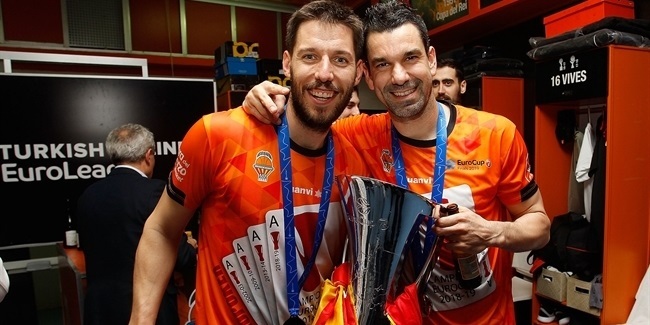 German players have a lot of good qualities and we are trying to make the most out of that, adding a bit of spice - how to read the games, how to improvise on the court," Frade says about his players. "I believe it is working well and German players are thankful; they have more freedom and possibilities to do things. What we are trying to do is that the skills and quality they have is released through individual and collective workouts, plus Aito's mentality." "Players have a great work ethic when it comes to physical training; they will do what you say. What we may have offered are some improvisation, some adjustments to read the game better, to read new situations, giving them more options also on a physical level. That is maybe the biggest difference we made," Silva said. 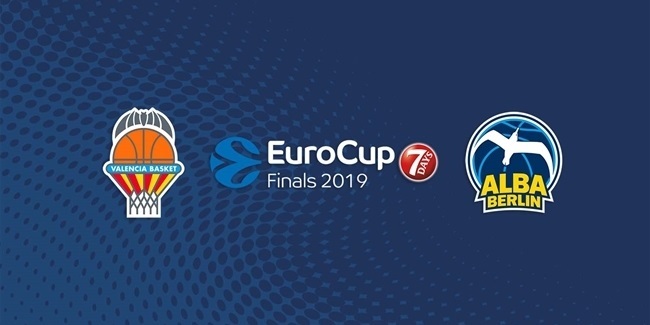 ALBA is on its way up and its Spanish army will try to take the series back to their country of origin. Game 2 will be played at Mercedes-Benz Arena on Friday at 20:00 CET.